The Magellanic Plover, Pluvianellus socialis, is a rare and unique wader found only in southernmost South America. It was long placed in with the other plovers in the family Charadriidae, however behavioural evidence suggested they were distinct, and molecular studies confirmed this, suggesting that they are actually more closely related to the sheathbills, a uniquely Antarctic family. 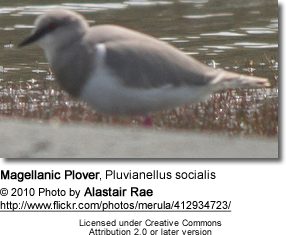 As such it is now placed in its own family, Pluvianellidae. This species is not a long distance migratant, although some birds move further north in southern Argentina in winter. The species breeds inland and then moves to the coast during the winter, particularly to estuaries. This species is in its structure and habits much like a turnstone, but it cannot be confused with any other wader species. Its upperparts and breast are pale grey, and the rest of the underparts are white. It has short red legs, a black bill and red eyes. In young birds, the eyes and legs are yellowish in colour, and the plumage is grey overall with scaling. The call is a dovelike coo. This species breeds near water, usually saline lakes but there are reports of nests near rivers as well. Pairs defend territories, and both parents share incubation duties. It lays two large eggs on the ground, although usually only one chick survives. One unique aspect of its behaviour and physiology is its method of feeding its chicks. Chicks are fed by regurgitating food stored in the crop, with this species being the only wader to do so. 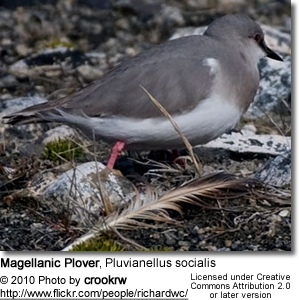 Magellanic Plovers feed on small invertebrates, picked from the ground, or from under pebbles, again like a turnstone. They have been observed collecting worms in the bill in a similar fashion to a puffin.